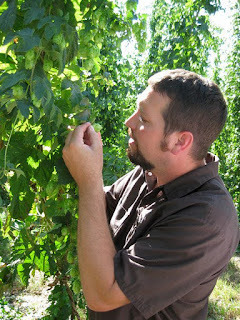 Next up in our meet the geek series is Matt Van Wyk of Oakshire fame. You can often find Matt running around Portland promoting some Oakshire love. We ran into Matt the other night at The Guild Public House for the Ill Tempered Gnome release. Favorite Beer: Rodenbach Grand Cru if I had to choose. Favorite Beer Haunt: Not sure I have a favorite beer haunt. Perhaps my bar room and kegerator. I control the TV. What was the first craft brew you ever tried? What did you think? Millstream something or other in Amana, Iowa. It was a college field trip of all things. Loved it! Do you homebrew? If yes, favorite homebrew to date: Nope. I brew too much at work to love doing it at home. How’d you hear about the pdxbeergeeks? I met Emily at one of our beer releases and then found out about it at the Bloggers Conference. What does being a beer geek mean to you? Being a beer geek is really all about just caring for the beer you drink, or serve, or make. Giving it it's appropriate due diligence. What do you love about Portland’s Craft Beer scene? The variety in not only beers to choose from, but the different environments and establishments to find good beer is what I love most.